Like most people who live in big, crowded cities, I'm fascinated by photos that show it back when there was a lot of wide open space. You know, before the freeways were built, before all of the buildings blocked the view, before everything got so crowded, like in Los Angeles, or Phoenix. Of course there's still a lot of wide open space around these places, as anyone who has ever traveled between LA and Phoenix knows, but the photos that fascinate me the most are the ones that show an area that is now so congested that I can hardly breathe, what it looked like back in the day. Don't get me wrong, I love LA and Phoenix, and I have never been tempted to live way out "in the middle of nowhere". I've seen places like that, along the 1-10 freeway, or looking out of the window of a Southwest Airlines plane. And I always wonder why people are living so far away from everything, and then I go and complain about how crowded it is where I live. Go figure! Of course, if you don't know the places in the old photos they just look like a bunch of nothing. But it's the bunch of nothing which is so fascinating when you do know where the photo was taken. Because in spite of the fact that we can logically think that there had to be a bunch of nothing there at one time, it's hard to picture when all we've seen is traffic, and buildings, and congestion. 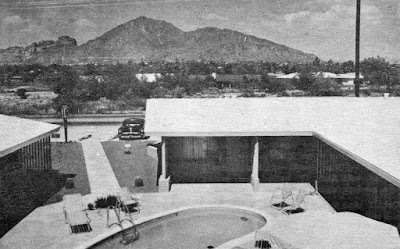 Image at the top of this post: Looking north towards Camelback Mountain from Thomas and 57th Street in the 1950s, Phoenix, Arizona. I'm fascinated by the wide open space!